OARDC scientists have developed new materials that will allow medical professionals to have the natural latex gloves they prefer while avoiding the risk of allergic reactions. The patent-pending materials include a latex film made from guayule (pronounced “why-yoo-lee”) that is safe for both Type I and Type IV latex allergy sufferers, and a traditional Hevea (“hee-vee-uh”) rubber tree latex film that is Type IV-hypoallergenic. To make the gloves Type IV-hypoallergenic, Cornish and her graduate students used new “accelerators” — chemicals added to speed up the curing reactions and production of latex products — that don’t leave residues associated with this type of allergy in the finished product. 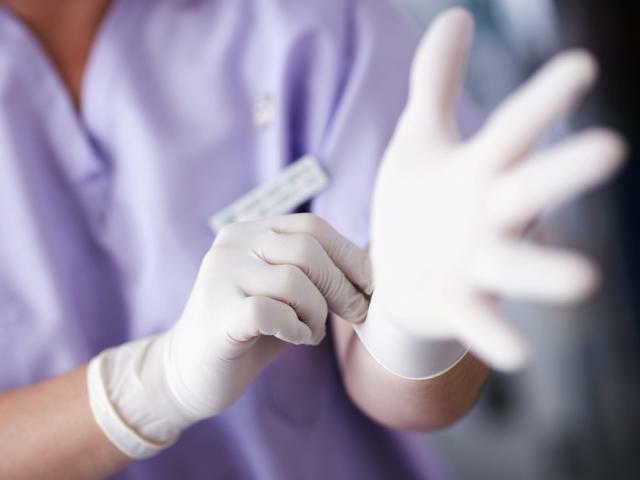 Medical professionals prefer natural rubber latex gloves over synthetic ones because they’re stronger, have more tactile sensitivity, provide superior protection to blood-borne pathogens and cause less hand fatigue. OARDC is conducting guayule trials in southern Ohio. Aim: Developing a new domestic rubber- and latex-producing crop, and with it, new economic opportunities in the region. To contact the scientist: Katrina Cornish at cornish.19@osu.edu.